When you are caught in a survival situation, one of the best useful tools that you can have is a fixed blade knife. However before you can hope to benefit from fixed blade knives, you should choose the best one that fits your needs. Everyone will have an opinion when it comes to the best fixed blade knives and there’s not necessarily a single-best blade out there. It’s all about choosing a knife that caters to your unique needs. With that said, here are some tips to help you choose a fixed blade knife. The perfect size for your fixed blade knife depends on what you plan to use it for. If you plan to use it for bush work including a lot of chopping and slashing you should consider a longer knife. If you are more interested in carving or field dressing you may consider a slightly smaller knife that will give you more control over both the tip and the blade. Fixed blade knives can be anywhere from 24 inches to just 3 or 4 inches. Take time to reflect on how you plan to use your knife and buy accordingly. A big knife may look cool, but won’t be effective for precisions tasks. You should also consider your local legislation to make sure your blade does not exceed any limitations. The strength of your blade is one of the most important factors and comes down to what kind of steel you use. You can choose between a tough knife that can withstand impacts or a strong knife that can keep its edge. This is, again, dependent on what you plan to use your knife for. There are three different types of blade steel that can be used on fixed blade knives: high carbon steel, stainless steel, and laminated steel. High Carbon steel is the toughest option. It can withstand the impact necessary to chop saplings or to baton wood. High carbon steel falls short in holding an edge. Stainless steel is much better at holding its edge, but may break under high demand. Thus, stainless steel is the better option when it comes to carving or field dressing. A nice laminate steel can offer the best of both worlds, but at a high price. The shape of your blade is largely dependent on how you plan to use your blade. There are many shapes like the recurve which can offer more chopping power or the clip tip which can help improve your control of the blade’s tip. Choosing the right blade shape for you will require a little research, but will pay off in the end. Don’t just pick whichever you think looks the coolest. Make sure it is suited for your needs. The design of the blades edge can be vital to determining how well it is suited for certain tasks. If the blade straight or curved? Depending on how to use your blade this could create large benefits or create serious problems. Again, do a little research to make sure the blade you purchase does more than just look cool in pictures. The construction of your knife’s tang is a vital factor in determining its strength and balance. There are three types of tangs: full tang, hidden tang, and partial tang. The heavier and thicker full tang is the strongest since it runs the full length and width of the handle. The hidden tang is right in the middle, it doesn’t quite run the full length of the handle, but it is able to provide decent strength at a lower weight. Finally, the partial tang is the lightest and weakest tang. It doesn’t run the full length or width of the handle and therefore provides less strength. It may not be necessary for you to spend extra for a heavier full tang though. The handle of your knife is very important. Make sure you like the shape and material. A knife you can’t get a proper grip on is the most dangerous knife there is. 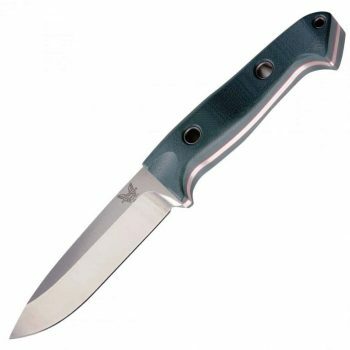 Consider high-tech materials like Micarta or Kraton for the handle. These materials can dampen impacts if you use your knife for chopping and brushwork. Which are the best fixed blade knife in the market? The Cold Steel Recon Scout is a striking blade. The black blade and handle create a striking blade that your friends are sure to envy. The size of the blade also contributes to striking appearance. Coming in at almost 13 inches long featuring a 7.5 inch blade this blade won’t shy away from more tasking activities like cutting through brush or even batoning. Thanks to the high carbon steel SK6 blade you’ll never have to worry about this knife not being tough enough to withstand your time in the woods. This knife can handle anything you can throw at it. The knife features a nice clip point which will provide more control of the tip. This is increasingly important in such a large knife if you plan on doing any precise work like field dressing. The clip point also gives this knife the appearance of the classic bowie knife. The clip point together with the guard come together to mimic one of the most iconic blade designs of all time. These classic looks get a modern touch from the Kraton handle (which will dampen impacts) & the black steel blade. This is a great blade for a great price. This knife is as cool as they get. Not only does it have a cool shape, but it also comes with and ankle wrap so you can hold the lightweight knife out of the way. 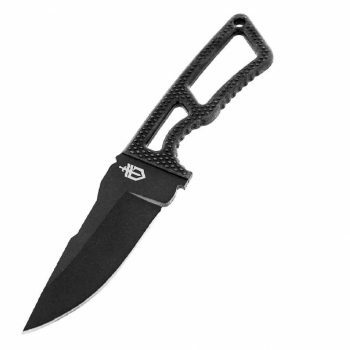 The Gerber Ghoststrike Knife is one of the smaller knives on the list with only a three inch blade. It can be used for general camping activities like cutting rope or carving, but will fall short when it comes to completing any brushwork. This knife is one of the best small knives available. The knife isn’t just small, but also lightweight. Even for its size, this knife is about as light as they come thanks to its skeletal frame design. The handle design adds to the cool factor of the knife almost as much as the ankle wrap that will you make you feel like one of the most experienced survivalists to ever enter the woods. The ankle wrap is neoprene and very small which makes it immensely more comfortable than you would expect. The wrap can also be easily converted to attach to your belt. The blade is plenty strong to handle anything you would use a compact knife for thanks to its 420HC steel. It will also hold a nice edge. 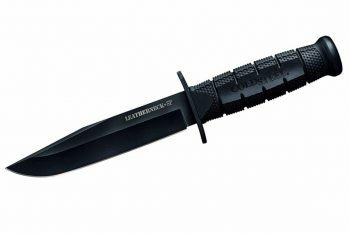 The Gerber LMF II Knife was inspired by the idea of being stuck behind enemy lines left to fend for yourself. This knife has been designed as a jack of all trades. While it is not big enough to do most brushwork it is able to handle anything else you could throw at it. In fact, it has been field tested by troops and is just as adaptable as those who carry it. Everything on this knife has been precisely engineered all the way down to the ergonomic handle, which is designed to prevent blistering even under extreme use. This blade features a black steel blade with a partially serrated edge to give it an added boost of versatility. The handle features a soft grip molded around a hard substrate to maximize the strength and comfort of your grip while also minimizing impacts. The blade itself can also be easily converted into a spear since the back of the handle comes unscrewed. This is a unique feature that really showcases how well engineered this blade is. Even the sheath has been engineered to minimize the sound it makes when moving or when you remove the blade. Very few blades have the attention to detail this one does. The SOG Seal Elite Knife is a great compact knife. It has a great profile thanks to the ergonomic handle and clip point. This knife is exceptionally well balanced and will give you tremendous control. It may sound cliché, but this blade can truly act as an extension of you. This is also thanks to the incredibly well designed nylon handle, which is strengthened with injected glass. The handle features deeper finger grooves and handle scores to increase the knife’s comfort and allow you a better grip. The handle also features a helpful lanyard hole. The shape of this knife is truly something special. It is serrated along the back and features a beautiful clip point. The blade also has a unique spine with an added spine rasp for notching, filling, and thumb placement. Together, these features make this knife just about as cool as it gets. The icing on the cake is the black TiNi finish that is both functional and cool. The blade is backed up by a lifetime warranty to assure the user of its quality. On top of all that, the blade comes with a nylon sheath that features a belt loop attachment. The KA-BAR Marine Corps Knife is another one of those knives that is so cool it’s hard to pass up. This knife is cool before you even remove it from the sheath. The sheath features the US Marine Corps crest and branding on the leather. The Sheath also features a belt loop. The knife gets even coolest from there. The handle is made from leather washers and has a unique design with small gaps that expose the knife’s full tang underneath. The full tang is important for a knife of this size that will be used for combat and field work. The blade itself has a small clip point like most combat knives, but this is one of the most famous blade designs in the world. The subtle design is easily recognizable by anyone familiar with knives. 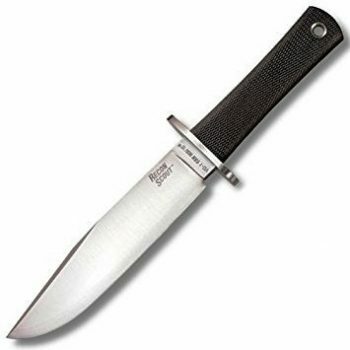 The blade also features a guard which gives it a similar appearance to the classic bowie knife. 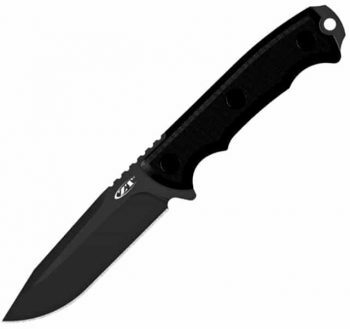 The black steel blade is made from ultra-tough 1095 Co-van steel. Which gives it plenty of strength for any field work you could throw at it. On top of all that, this blade is manufactured here in America. The Tops Knives Mini Hoffman Knife is an incredibly useful and unique knife. The knife is incredibly light and can be converted into a harpoon using the paracord handle. This is truly one of the most interesting knife features you can find. Since the blade is so short and light it offers exceptional control. You could use this knife for even the most precise tasks thanks to its near surgical control. It is also very well balanced to add to the experience. This knife is commonly used as a high caliber backup knife and Tops Knives suggests keeping it in your car in case of an emergency. The more you look at this knife the harder it is to look past the unique blade shape, The knife is shaped the way it is to provide the best control while also creating a lethal harpoon shape. The knife is also one of the sharpest knives you can find out of the box. It will keep its blade well thanks to the high strength steel it’s made of. This is one compact knife that packs a big punch. I would recommend this knife to anyone. 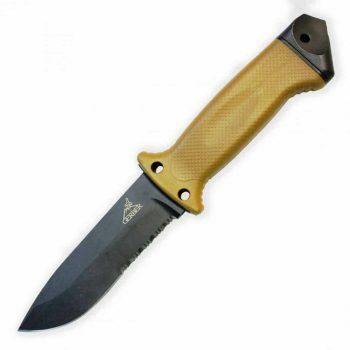 The Columbia River Knife and Tool 3500 Knife is a great utility knife. It’s large enough to handle some serious work, but also compact enough to stay out of the way when you’re not using it. It is also incredibly balanced which gives the user precise control of the tip and cutting edge. 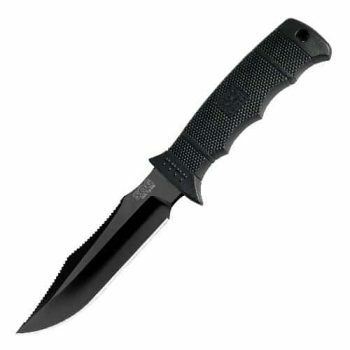 The cutting edge features serrations to add to this knifes general usability as well. The knife also has a flat grind and durable clear Cerakore coating. All these factors together makes this a formidable knife. This knife is just about as strong as they come. It features a full tang and is made from a solid billet of 1095 high carbon steel that carries a Rockwell Strength Rating between 56 and 58. You’d have to work hard to break this knife, but, if you do, it is protected by a lifetime warranty. The handle is a unique layered design and is drilled out to help improve the knife’s balance. It is ergonomic and provides very good grip to anyone wielding it. It also features a handy paracord lanyard that can come off and be used in a survival situation should worse come to worst. The Zero Tolerance G10 Knife is a very basic knife that comes with everything you could ask for. The no frills design includes an ergonomic handle and 4.2 inch blade. The blade is well balanced and offers superior control to other blades at this price point. The full tang makes this blade feel a little extra solid by adding a little weight. It feels nice in the hand and empowers the user to feel more confident with the blade in hand. Overall, this is a great knife to use. The handle features ergonomic finger tips that allow the user to have an incredibly controlled grip on the knife. Using this knife in precision situations is a dream thanks to the sharp edge, which the knife holds well thanks to its extra strong steel construction. The blade is also coated in a tungsten DLC coating that offers extra durability and a cool dark grey color. This knife also comes with a belt sheath. This is a knife I can highly recommend for the price. Every dime you spend is worth the quality of the blade, handle, and design of the knife itself. You don’t pay for any added frills. 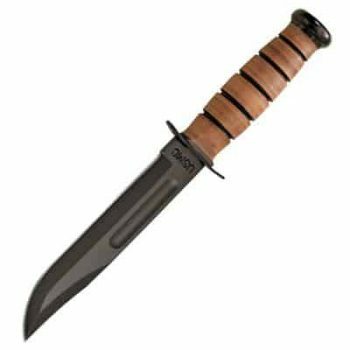 The Cold Steel Leatherneck SF Knife is a fixed blade knife that can trace its roots back to the iconic bowie knife. The clip point, large blade, and guard pay homage to its inspiration and really cement the knife’s looks and usability as a combat knife. The blade is all black thanks to the DLC coating on the German D2 steel blade. The effect is cool, but the DLC coating also offers superior durability. This knife is named after the famous high leather collar that the US Marines have worn since 1776. The blade is aimed at those who honed their skills using knives in combat, but now have different needs. It offers some similarities to combat knives, but is more practical in field work applications. 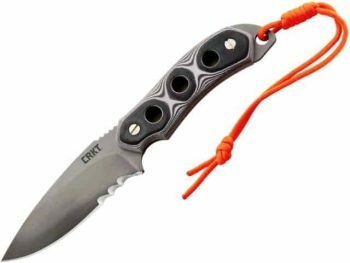 This Blade features a unique handle made of Grivory and Kraton that will minimize any impacts while using the blade while also offering a great grip. The knife is well balanced and easy to use. It will make the most experienced feel even more empowered while helping to instill some confidence in novice users. You really can’t go wrong with this one. The blade comes with a belt sheath. The Benchmade Bushcrafter Knife is another no frills knife that will get the job done. This knife features a beautiful polished design as opposed to all of the black coated blades on this list. Its simplicity really makes it simple to use, well balanced, and gives it a confidence that is unmatched by other knives. You pay for everything you get and when you’re not paying for frills you can get one of the best knives around at an exceptional price. The blade is made of hard stainless steel that will hold its edge better than any knife on this list. You could shave with is out of the box. The blade also comes with a buckskin leather sheath that comes with a D-Ring, rod loop, flint and retention strap. Fixed blade knives are the strongest and most versatile knives you can find. They can be used as machetes or even used to complete tasks with surgical precision. If you have any knives you think should be on the list, drop them in the comments below. What do you typically use a fixed blade knife for?